magicians for magicians. 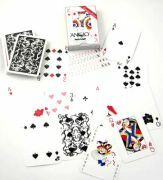 It was introduced in April 2009 and has been developed from the Anglo Rug Deck introduced by Offason at FISM WCM in 2006. It has been tried and tested by a panel of 15 experienced Swedish Card Magicians (including one former World Champion and eight former Swedish and Nordic Champions). New face design with lots of white space for added visability. Looks nice with a signature on it! The only deck in the world you can take out of the box, break the cellophane wrapper (one handed) and instantly do all your sleights; fanning, water falls, and fancy shuffles without previously breaking in the deck. It works right out of the box! Each deck is inspected "by hand" before put in the box. The deck is also available as an Invisible Deck, probably the best Invisible Deck in the World. You cannot see or feel any rough&smooth treatment on the cards. Yet they stick together and separate just like they should. Red design on white. Anglo Rainbow Deck - 52 cards with the same backdesign but in 52 different colours. When you spread the deck in "new deck order" it looks like a rainbow. Anglo Gaff Deck - 55 different gaffed cards, gag cards and utility fake cars!